Mainz - Shinji Okazaki grabbed his fourth goal of the season to help 1. 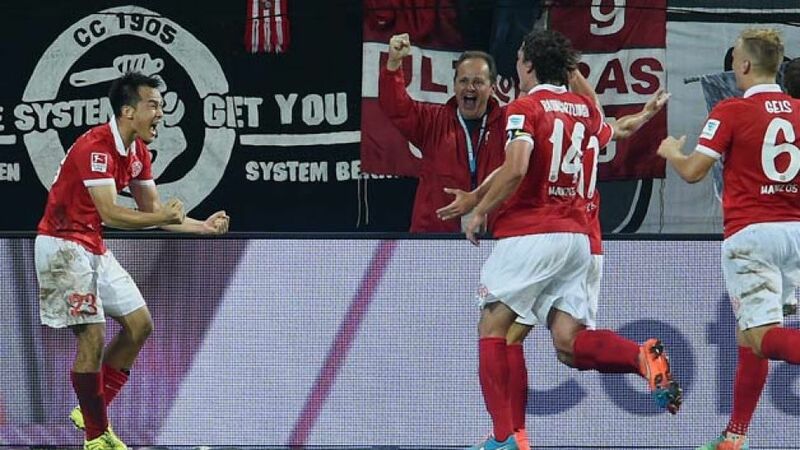 FSV Mainz 05 earn their first home victory of the campaign against a wasteful Borussia Dortmund on Saturday evening. After Mainz weathered an early storm, Okazaki struck in the second half before an own goal by BVB's Matthias Ginter compounded the visitors' misery, with Ciro Immobile also missing a penalty for Dortmund. Anyone who witnessed how Borussia dismantled Arsenal in the UEFA Champions League during the week will not have been surprised to see Jürgen Klopp’s troops begin confidently at the Coface Arena and they immediately went on the front foot. Indeed, the guests had the first clear sight of goal after just four minutes when Lukasz Piszczek superbly controlled a lofted ball on the right-hand edge of the box and shaped to shoot, only for a desperate block to deflect it wide. Still, it set the tone for much of the half, with Dortmund in absolute control and determined to burst forward at pace at every opportunity. The next chance fell to Adrian Ramos after neat interplay between Shinji Kagawa and Pierre-Emerick Aubameyang, whose cross from the right was headed narrowly wide by the Colombian forward. Mainz hauled themselves into the game as half time approached and managed to carve out a couple of openings for themselves. First, new signing Sami Allagui’s flick teed up Okazaki to test Roman Weidenfeller, who was alert again moments later to punch clear a swerving effort from Mainz’s Dortmund loanee Jonas Hofmann. Ramos then hit the post from Piszczek’s cross shortly before the break, as BVB finished the half the stronger. It was Ramos who had the first chance of the second period too, dragging his shot just wide of the post after superb play - and perseverance - by Kevin Großkreutz down the left. The pace of the game was no longer as frenetic as it had been in the first half but Dortmund continued to have the upper hand overall and it appeared to just be a matter of time before they scored. As it turned out, however, Mainz broke the deadlock following a defensive mix-up that allowed Okazaki to slide in and poke the ball over the line from close range, taking his tally for the season to four in as many games. BVB had the chance to restore parity almost immediately after a handball in the box, but substitute Immobile’s low strike was well saved by home keeper Loris Karius. Encouraged, Mainz pushed forward in search of the knockout blow and they floored the visitors shortly afterwards when Ginter turned the ball into his own net from Jairo’s centre. Dortmund’s last-ditch attempts to stage a comeback were expertly repelled by the hosts, who held on for three points, denying BVB the chance to make up any ground on FC Bayern München, who were held to a draw in Hamburg earlier in the day.